His Eminence Garchen Rinpoche (Tib. མགར་ཆེན་རིན་པོ་ཆེ་, Wyl. mgar chen rin po che), aka Könchok Gyaltsen (Tib. དཀོན་མཆོག་རྒྱལ་མཚན་, Wyl. dkon mchog rgyal mtshan), the Eighth Garchen Rinpoche (b. 1936), is a Drikung Kagyü lama who was known in the thirteenth century as the siddha Gar Chödingpa, a heart disciple of Kyobpa Jikten Sumgön, founder of the Drikung Kagyü lineage of Tibetan Buddhism. In ancient India, he had incarnated as mahasiddha Aryadeva, the lotus-born disciple of the great Nagarjuna. In the seventh century, he was known as Lönpo Gar, the minister of the Tibetan Dharma King Songtsen Gampo. Garchen Rinpoche was recognized and enthroned in eastern Tibet by the former Drikung Kyabgön, Shyiwé Lodrö. When he was seven, he was brought to Lho Miyal Monastery, which he administered from the age of eleven. Studying and practising under the direction of the siddha Chime Dorje, Garchen Rinpoche received vast and profound instructions on the preliminary practices (Tib. ngöndro), the fivefold practice of Mahamudra and the Six Yogas of Naropa. Then, at the age of 22, after completing a two and a half year retreat, he was imprisoned for 20 years during the political turmoil of China's Cultural Revolution. While in the labour camp, he received meditation instruction from his root lama, the Nyingma master Khenpo Munsel. 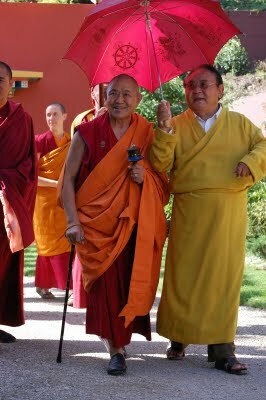 Enduring hardship and practising secretly, Garchen Rinpoche attained realization of the lama's wisdom mind. Since his release from prison in 1979, Garchen Rinpoche has made great effort to rebuild the Drikung Kagyü monasteries, reestablish the Buddhist teachings, and build two boarding schools for local children in eastern Tibet. Rinpoche has also founded several Dharma centres in the USA and Germany. Rigpa Berlin, 3-5 October 2008: rabné, teachings on the "Prayer of Kuntuzangpo, the Primordial Buddha Samantabhadra" and White Tara empowerment. Lerab Ling, 14-19 August 2009: White Tara empowerment, rabné and teachings on Tsik Sum Ne Dek. Dzogchen Beara, 14-16 October 2011: teaching on the bardos and phowa practice; empowerments of Amitabha & Vajrayogini; several lungs. Rigpa Newcastle, 26-27 July 2014: teachings on Tilopa's "Ganges Mahamudra". 2-3 August 2014: teachings on the Prayer of Kuntuzangpo. Rigpa London Centre, UK, 27 July 2018: teaching on "Transforming Difficulties Into the Spiritual Path". ↑ The Sixth Chetsang Rinpoche (1886–1943). This page was last edited on 28 July 2018, at 09:40.